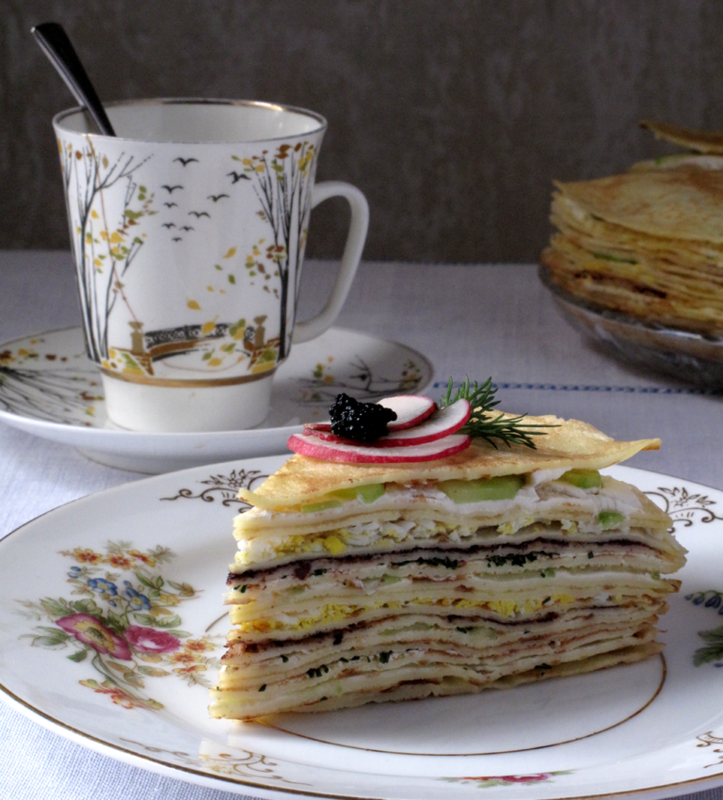 The savory crepe cake evokes my childhood memories. My mom will make it every year for her engagement anniversary celebration. I love the elegant look and the light delightful taste of the cake. Blend the ingredients until smooth. Mix all the ingredients until homogeneous texture. 1To make the crepe mixture add all the ingredients in a blender and mix for 15 min. Once the mixture is ready leave it in the refrigerator for 30 min. 2Heat a medium size crepe pan until hot. Lower the heat to low to medium and grease it lightly with butter. Pour some of the crepe mixture and tilt the pan in circular movement to coat evenly the whole pan. Bake evenly both sides of the crepe. 3Place a crepe in a serving flat plate. Spread an evenly thin layer of the mustard sauce on the bottom and lay a crepe on top. Spread another thin layer of cream cheese sauce on the crepe and arrange a thin layer of cucumbers on top of that. Sprinkle some dill evenly on top of the cucumbers and lay down another crepe to start the next layer. Repeat with the same ingredients. For the forth layer spread the black olives mixture and lightly shred on top half of the hard-boiled egg. Lay a crepe on top and arrange in the same order as in the beginning, making fourteen layers. Do not cover the the top (15th) one. 4If you have glass lid that will fit the plate cover with it and leave it in the refrigerator for couple of hours before serving. Instead of a glass lid you can wrap the crepe cake plate with plastic wrapping. 5Before serving garnish each individual cake piece with paper thin-radish slices topped with 1-teaspoon whitefish roe.